Congratulations to Melanie Waszak on winning our forty third High Five Giveaway and thank you to all who entered! 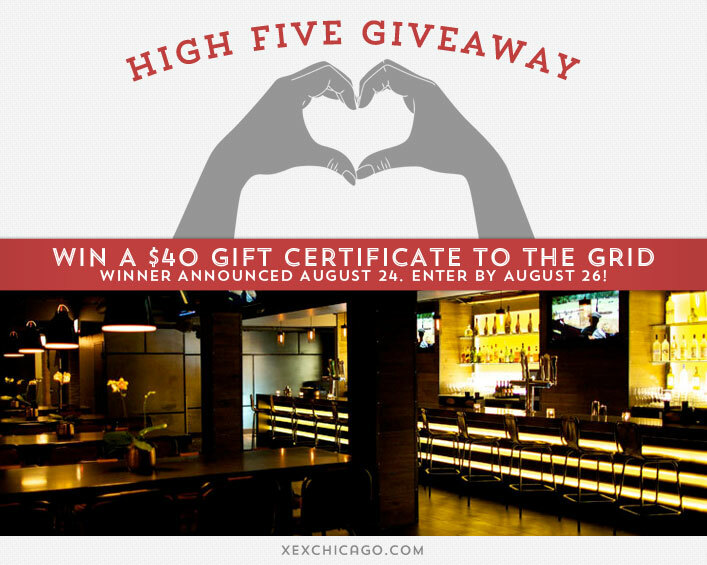 Our next High Five Giveaway is for a $40 gift certificate to The Grid. It’s mid-August. Summer is unfortunately nearing its end. What has been your favorite Chicago event this summer so far? Now, just add a comment to this post with the right answer to be eligible to win! The winner will be announced on Monday, August 26. Entries must be received by midnight on Saturday, August 24. Good luck! Wilson Phillips @ Market Days! Pitchfork Music Festival! I loved Bjork’s show, even though it ended early due to bad weather. I love the weekly farmers market at the Daley Plaza!! The Blackhawks winning the Stanley Cup! Free concerts at Millennium Park / Pritzker Pavilion and rooftop bars! The Handsome Family’s performance at Millennium Park. In addition to all the great street festivals, I have really enjoyed watching movies at Pritzker Pavillion on Tuesday’s at dusk at “Movies in the Park”. What a great benefit! Workouts at Millennium Park on Saturday mornings! So hard to choose just one – Blackhawks parade, Pride parade, Market Days! Summer is always awesome in Chicago! Navy Pier with my daughter for the first time! Lollapalooza! Seeing The Postal Service for the first and last time was such a great experience.